I’ve long been a fan of ranked ballots, a voting system that Dave Meslin and the good people at RaBIT have been promoting for a long time. At the municipal level, ranked ballots —also known as instant run-off voting — is a simple, yet effective way of improving local democracy. Ranked ballots ensure that politicians are elected because they can enjoy the support of a majority of electors, so they are fairer than the first-past-the-post system we currently use to elect city councillors. To some degree, it reduces the advantage that incumbent councillors enjoy due to name recognition, and they promote diversity in local politics. I think they’re a better idea than term limits, recalls, or municipal parties. The provincial government is currently reviewing the Municipal Elections Act; reforms may allow municipalities to adopt ranked ballots. At first the City of Toronto seemed to be eager to sign on; in 2013, Council adopted a motion to ask the province to allow ranked ballots to replace the current electoral system; more recently Mayor John Tory expressed his support for the idea. But during a recent council meeting, newly-elected Councillor Justin Di Ciano (Ward 5) just threw a wrench into the works. Calling ranked ballots “confusing,” he put forward a motion to ask the province not to allow ranked ballots. It passed, 25-18. The map below illustrates the result of that vote by ward. Incumbent councillors might be wary of ranked ballots, especially if they face multiple opponents. Fifteen councillors (and Mayor Tory) were elected with less than 50% of the vote; they would be vulnerable to ranked ballots. Three of those councillors: Ana Bailão (Ward 18), Joe Cressy (Ward 20), and Raymond Cho (Ward 42), were brave enough to vote the right way on Di Ciano’s motion. Conversely, councillors such as Norm Kelly (Ward 40, who won with 86% of the vote), Michael Thompson (Ward 37, 84%) and Jaye Robinson (Ward 25, 83%) voted for the motion. Justin Di Ciano himself won with 54% of the vote in Ward 5. The “yes” votes were mostly from Council’s right wing, but left leaning councillors such as Maria Augimeri (Ward 9) and Paula Fletcher (Ward 30) joined in. Augimeri would have almost definitely lost in 2010 had ranked ballots been adopted; it’s possible that Fletcher would have been voted out in 2010 and in 2014 under this voting system. 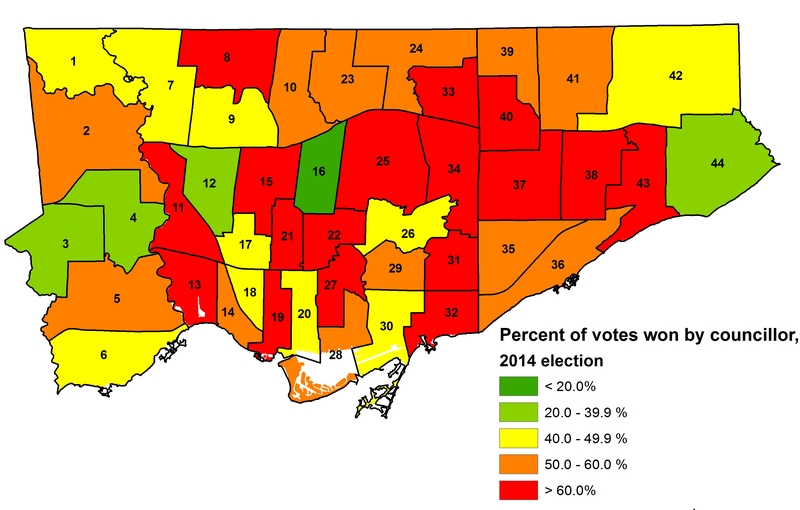 Map of the share of votes each councillor was elected by in 2014. The fight for ranked ballots is far from over; Mayor Tory still has plenty of political capital and sway with the provincial government. I’m hopeful that council will reverse itself yet again. In happier news, Council voted 25-18 in favour of asking the province to allow non-citizen permanent residents to vote in municipal elections. As local government is closest to the people, and makes decisions that affect most individuals on a day-to-day basis, I am in favour of such a move. That said, I still believe that electing federal and provincial representatives should remain a privilege afforded to Canadian citizens. This entry was posted in Election, Maps, Toronto and tagged 2018 Election, Justin Di Ciano, ranked ballots. Bookmark the permalink. Though you don’t actually have to confirm your citizenship in provincial and federal elections. A driver’s license will do.